Being a world leading speaker developer and manufacturer Dynaudio wants to be a part of the future regarding active and smart speakers. They want to make a new and innovating speaker that is easy to interact with and can enhance the life of their customers. Dynaudio is known worldwide for their great sound quality but are lacking in design. So far the first priority has been on the sound and how to obtain the best possible quality. Second priority has been the usability leaving design as the third and last. 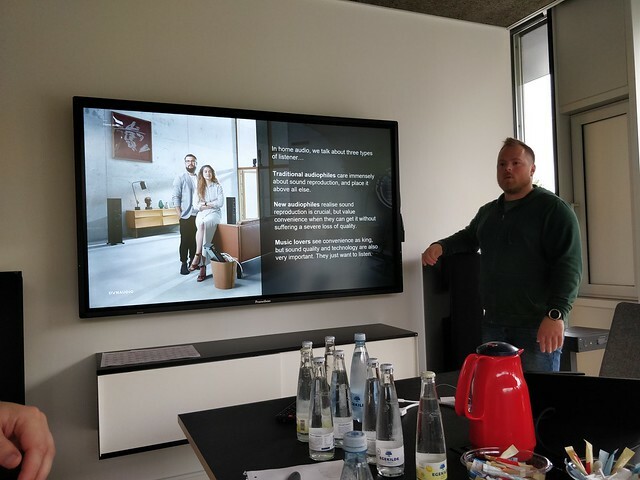 With the new speakers Dynaudio wants to improve the usability and design to engage the customer and improve the user satisfaction. As we see it, Dynaudio’s main problem is that the company has remained a bit conservative in their design and interactive technology. We will try to solve this problem by creating an interactive smart speaker with an innovative design that has not been seen before. In this product two stereo speakers are combined with a center speaker. Its customizable; The combined speaker can be hidden in the ceiling and then by wires be hoisted down. Furthermore the combined stereo and center speaker can be split and via. Rails the two stereo speakers can be rolled out to the sites to create the perfect stereo experience. A non rail version where everything is fixed can also be bought. The stereo system is active and smart. It can be voice controlled. The system can also automatically show the “Acoustic Sweet Spot” – And change it depending on the amount of people in the room and their position. Furthermore music can be transferred to other places with Dynaudio speakers e.g. other rooms and the owners vehicle. After the first meeting with our case partner where the case was presented we thought about how to get the most out of our limited research time. Christian form Dynaudio had already set up an interview with a customer and made time for us to visit the factory in Skanderborg. Beside that we decided to visit two Hi-Fi stores located in Aalborg. One of those, Lydspecialisten, is an official distributor of Dynaudio speakers whereas the other store, Hi-Fi Klubben, do not sell their products. We also looked into consulting the Danish loudspeaker company, B&O, due to the fact that they are a competitor to Dynaudio. However, Dynaudio does not see B&O as a competitor as we thought they would. Therefore, we chose to visit Hi-Fi Klubben instead to get a broader perspective because they sell speakers from different manufactures. Before diving into the fieldwork, we considered how to do the research as effectively as possible. Therefore, we wrote down questions and divided ourselves into multiple groups where all three of our different educations were represented. In these groups we prepared semi structured interviews in order to ask our questions but also be openminded for new insight and knowledge. Our focus has been on investigating what the potential user seeks in a modern speaker. Furthermore, we have investigated what speaker is the most popular at the moment and what the future tendencies within the market look like. After collecting our data, it was compiled using the method called affinity diagram. This method was chosen because it’s well suited for compiling a large amount of data and flexible for reorganizing the data. At first the data was divided into categories according to the four different visits. Later on when comparing the data it was regrouped into new categories. Comparing the data we made five innovations tracks using the core design framework. The main focus here was to find the quality criteria for the users and thereby determine what creates value for them. On this meeting Christian and the group agreed to work with interactive services. This should be the main focus for the project and the concept development process. We now have to choose between whether to go with a smart house solution or a centered speaker. Furthermore, we can choose to implement customization as a part of either of the two possibilities. Thereby we have agreed to stop working on the innovation track concerning subscription. After the second meeting with Dynaudio, we continued with the sketching process. 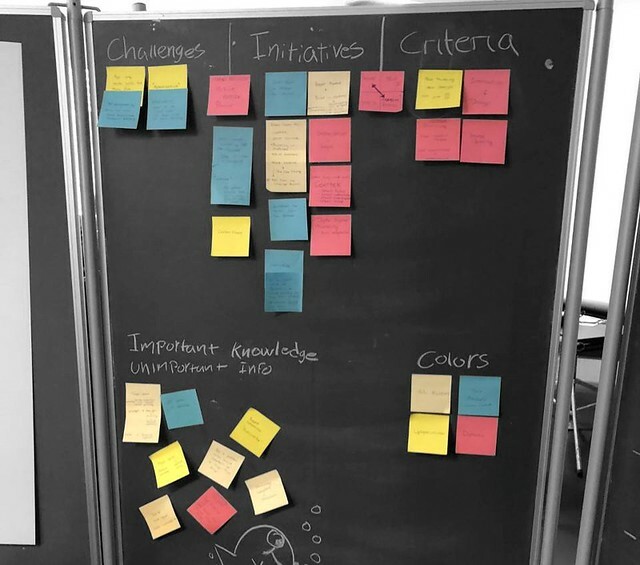 The focus of our sketch development was on trying to combine our four remaining innovation tracks in different ways, thereby developing them further. Throughout this process, we aimed at keeping a high level of creativity and having an open mind in order to develop new sketching ideas and possible designs. As a result, we did not start out with five finished sketching ideas but developed them along the way. This led to the five sketches shown below under the “Concept skteching” section. For the sketching we used different techniques such as stop-motion, animations, and greenscreen. Combining our sketches we came up with our final concept which is shown and described under the “Concept video” section above. To visualize the concept we mainly used greenscreen and animations. With this idea the group came up with a speaker solution where the speakers are hanging from the ceiling and when activated it will rotate and come down, so it can play music. The main focus here was on interior design and how to integrate speakers into a room without taking up too much space. With this idea, the speakers are submerged into the floor. When activated they will come up through a hole in the floor, and then they can play music. 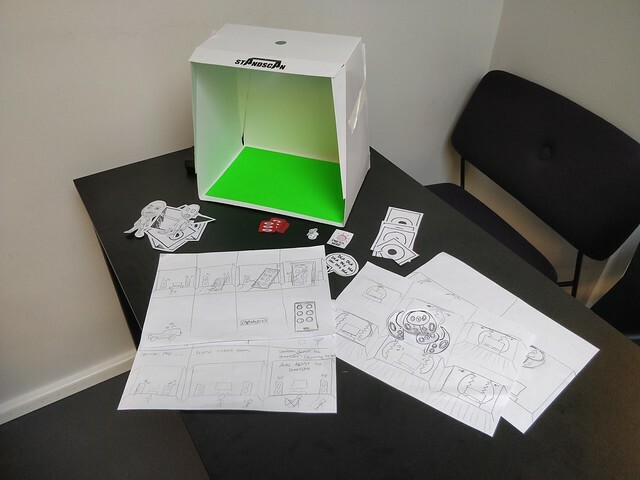 As with sketch number one we tried to come up with a solution which could be hidden completely away when not in use. With this idea, a centered speaker can divide into two and then roll out to each side and then start to play music. This sketch focuses on the external design of the speaker. We tried to come up with something surprising and innovating. The oval shape is also great for the sound quality. With this idea it’s possible to turn on the speaker system with voice control and change the songs via voice control. Furthermore, the speaker system can show where the “Acoustic Sweet spot” is located, both with one person in the room and with several. When more people appears the speaker will automatically adjust the sweet spot. With this “Smart House idea” the speaker system is voice controlled, and there is and app where the playlist can be transferred to different rooms and e.g. the car. This solution is used by many speaker manufactures but Dynaudio haven’t utilized it that much yet. Maybe Dynaudio can develop the technology further.